It seems there are only two matters to talk about when it comes to Ferrari's performance in Malaysia: the car's dominance over the opposition and Massa's mistake. The first was not entirely unexpected, considering the team's form in testing, and most observers were predicting that the troubles in Melbourne would prove to be a temporary blip in fortunes. McLaren's lack of pace on this circuit made the Ferrari look even better, if anything. The strange thing is that no-one has examined the apparent reversal of both teams' form in comparison to last year, however. 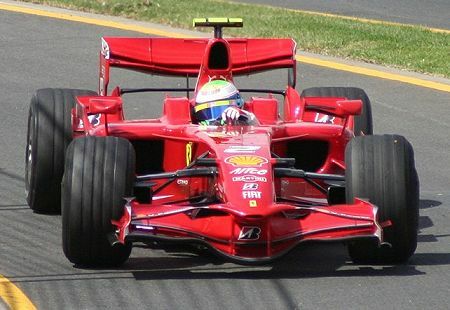 Kimi Raikkonen won easily in Melbourne in 2007 and McLaren could not keep up, this year it was McLaren who seemed to have the better car while Ferrari dropped back; last season Sepang was a McLaren track and it should have come as a surprise that Ferrari had the upper hand in 2008. It may have been that Ferrari managed to fumble themselves out of contention in Australia, disguising their true capability as a result, and the re-surfacing of much of the circuit in Malaysia has benefited Ferrari more than others; it certainly looked as though the Ferrari used its tires better thn did the McLaren last Sunday. But is this the whole story? Even when the Ferraris were running at their best in Melbourne, they did not look a match for the McLarens and it would be surprising indeed if the resurfacing in Sepang made such a drastic difference to the McLaren's handling. Could it instead be a wheelbase issue? The new McLaren has a longer wheelbase than the previous model whereas Ferrari have shortened the wheelbase on the F2008. So it may be that the two teams have swapped the characteristics of their cars for those of their main competitor's. That might mean that 2007 Ferrari tracks would become McLaren circuits this year and vice versa. And, extrapolating things even further, it could even produce a McLaren championship instead of a Ferrari one. That is taking things too far, perhaps, but I did think it amusing that both teams decided to copy their competitor in the length of their new cars' wheelbases. Obviously, it galled Ferrari that McLaren were so quick on the tight circuits but the boys in Woking were determined to be better on the sweeping circuits this time round. There is a lesson there but I'm not certain what it is! And so, to Mr Massa. The poor guy is getting a lot of criticism for his apparent mistake in Malaysia and the assumptions that he cannot cope without traction control are strengthened as a result. I do not usually find myself defending Felipe but, on this occasion, I think he may be getting a raw deal. His Ferrari flicked so suddenly and inexplicably to the left that it made me think immediately that something had broken at the rear. It was well before the apex of the corner, too, and if Massa caused the rear end to lose grip by accelerating too soon (as most are saying), he must have completely altered his technique for some reason - he had made it through the corner plenty of times before without a hint of trouble, after all. "When he clouted a kerb it stalled the car's aerodynamics and caused him to lose control of the rear at the following turn - pitching him off the track and into a gravel trap." That is an interesting take on what happened - I, for one, did not notice him clip the curb on the preceding corner and it seems odd that doing so would "stall the aerodynamics". All the drivers clip the curbs at times, the McLaren boys more than most, but we do not hear of the aerodynamics being affected. So I take this explanation with a pinch of salt, but note that Autosport do not go along with the majority "lack of TC" verdict. In the end, I can only say what I saw on the TV, and that looked to me like a mechanical breakage in the rear suspension. That sideways step was far too sudden to have been caused by the clumsiness of Massa's right foot. Of course, I could be wrong and it is a pity that he could not continue after getting bogged down in the gravel; if it had been a mechanical fault, we would soon have known by the Ferrari's subsequent handling. But, for the moment, I think it would be fair to give the little Brazilian a break. There is a whole season yet for him to demonstrate that he is not entirely dependent on TC and we should allow him that. He did grab pole position too, didn't he? Watching Massa, fly off it looked to me like 6 of one, half a dozen of the other. I'm pretty sure you could see him lose it about mid-way through the corner that perhaps he might of been able to control but it was very strange how he got into that position in the first place, possibly a handling glitch. Although watching Massa's performance, it looked like even though he was 4.9 seconds behind Raikkonen, needing to catch up that time, either overtake and get Raikkonen in the pit-stops which looked a tall order to say the least he still continued to push very hard. I think, maybe he pushed a little too hard. Then again, Mad reckons such was Massa's ego and possible humilation by being beaten by Raikkonen in the pits again he had to keep pushing. Personally, I don't have a high rating of Massa at all. I consider him a pole position driver, if he grabs pole which he often does he stands a good chance of winning, however if he doesn't, you can never really put your money on him like you can with Raikkonen or Hamilton. The kind of racers who you'll always fancy no matter where they qualify. I think, he's a good racer but can only really do it if he's in a position to control the race. I also think he's too much ego and not enough skill to back it up, he's always come across to me as very up himself and his own ability but never really backed up that. Just my verdict though, as for the traction control making him good? I doubt it was just that, obviously he's struggling with the change but who isn't. Plus his pole lap was pretty damn quick too. I must admit it looked anything but driver error to me too - but everybody else seems to be blaming Massa so who knows. It's strange that Ferrari will do anything to protect the integrity of their cars, even going so far as to blame the drivers for any mistakes, whereas McLaren are happy to soak up the blame even for incidents that appear to be their drivers fault (depending on who the driver is...). Is this because the Italians are roadcar manufacturers and worry that failures may affect sales if people are worried their own car may fall to bits going round a corner? Or can they simply not bring themselves to admit any failings? The thing about Massa is that he is obviously quick, Pootle - and he keeps Raikkonen honest in the qualifying sessions. He seems to lose his cool too often in race situations, however, and the incident in Malaysia is a good example if it really was driver error. It is clear from what Raikkonen said after the race that Massa was trying his hardest to keep up and pass Kimi; in the situation, a Ferrari one-two without opposition, that was silly. Raikkonen had already demonstrated (by his quick laps while Massa was in the pit) that he had the measure of Felipe and it was best for the team if both were to ease off and just keep the distance to Kubica. So, far from being a great team player, I think Massa may not be good for the team at all - his need to prove himself forces him to make rash decisions at times. I am to be counted among those who doubt the ‘official’ story in respect to Massa’s accident. The available footage, together with his performance to that point, is just not consistent with a lack of T/C type error. Incidentally, match this footage against that of Raikkonen’s ‘driver error’ in Monza and both display a snapping out of control, which is much more indicative of mechanical failure. Is it Ferrari only too ready to blame their drivers for these suspect accidents, or is it the drivers only too happy to protect Ferrari from attracting a Red Bull type safety scrutiny, which any team can well do without? Massa is a quick competent driver, he just doesn’t have that mystery factor that Raikkonen and his very few peers have entertained us with over the years. Could it have been the heat? Obviously Ferrari have had more training in the heat than the other teams, and the humidity during the race was not as high as anticipated either. But the heat in the cockpit can do many suspicious things to a driver. Let's say that his water source had been failing, and he began to fall into dehydration. That certainly could be one of the explanations. Massa is such an good driver so i actually don't think that this error could be explained merely by driver error. So, maybe you're right anyway Clive. Maybe there's just another proof of that Ferrari have failed to build a reliable car this year. It was interesting that a number of drivers had problems with their drink supply during the race, and Massa may have been one, although he didn't mention it. I am no big Massa fan, but just before he shot off the track I thought that I saw a puff of black smoke shoot out from the rear left hand side of his car. Looked a little like what happened to Webber in Melb quali, but the subject has been strangely quiet. Did I imagine that, or did anyone else see it?? So until it is conclusively proven to be driver error, I won't stick the boot into Massa ! Must admit that I didn't notice that, Peril. It would be consistent with the brake failures experienced so far this season, presumably thanks to the heat in which the GPs have been run. given what happened at the first turn in melbourne, i'd say that critics have been justified in jumping to conclusions this weekend. he drove like a rookie in australia (or worse), and he did nothing to redeem himself in sepang. yep, he got pole, granted. but he was lighter than kimi. i say his head got messed up after seeing a red car come out in front of him during the first pitstops and the rest is history. You may be right, Sidey - indeed, my son Mad says Massa is a big girl's blouse! I'm just pointing out that this particular incident may not have been Massa's fault at all. I don't think your wheelbase explanation is the right one. I believe (and those better informed please correct me) that although Ferrari shortened their wheelbase and McLaren lengthened theirs, the Ferrari is still longer. I don't think we'll see a direct "swap" of results. It is true that the design philosophies are converging (funny considering the spygate saga). A more likely reason is that in Melbourne the Ferraris were quick but stuffed up qualifying. In Sepang the McLaren aero package wasn't up to scratch. The car was difficult to control and some have suggested that is the tyres. Yes, that's true but it is obvious that the control issues will manifest themselves in the tyres -- the more likely explanation is that the aero package didn't allow the McLarens to generate the downforce required or that it somehow unbalanced the car. I'm not sure Malaysia was a McLaren track last year. The Ferraris stuck it on pole and where it not for some dreadful driving at the start may have got in front. As I recall Lewis pretty much held both of them up allowing Alonso to waltz home with the victory. On Massa after adjusting for fuel he would still have been comfortably on pole. Looking at the video of the incident, Clive, I don't think Autosport's assessment rings entirely true. He uses a bit of kerb at the first part of the corner but the car seems fine after it - it's not as if he's wrestling to get it under control. And then at the second part of the corner he just spins off. If they'd told me it was a car failure I might have believed them because it got away from him so quickly. But it seems he just lost control. Again. I wouldn't bet against him bouncing back at Bahrain, though - he did last year. And that aerodynamic stalling doesn't quite ring true. The only two things that cause a stall are either a) the angle of attack increases or b) the the air speed falls. I don't think either of these happened. Yeah, I'd agree with what you say about Autosport's theory, Keith - don't know where they got that from. But I'm just saying that there remains some doubt over the spin and it's a bit early to talk of him getting kicked out of his seat. My wheelbase theory was offered in jest, John - I just thought it was amusing that the great enemies of F1 should have given each other the respect of drifting closer to the other's solution from last year. Schumacher said Massa's mistake in Melbourne was to approach the corner in the wrong gear. Could it have been a repeat? I don't have the incident recorded anymore to revisit, but at what point of approach was he? If he was in the wrong gear, torque from throttle application may have unsettled the rear. Well, well, well.............after all the Massa bashing and talk of replacement here are several somewhat level headed statements that DON'T condemn him. THANKS guys. I'm no Massa fan nor do I know what happened to him at Sepang but I think most of us have finally concluded his problems are NOT the lack of last years driver aid known as Traction Control. Frankly, ALL drivers are getting along just fine without it which asks the question why ban it? Technology is technology, this is F1, the so called pinnacle of motorsport. we ban re-fueling. Maybe banning advertising on the cars would reduce the number of dollars, pounds, euro, yen, etc and we'd slow down 'development' long enough to enjoy a season of motorsport. Well, I'm for banning re-fueling, Number 38. And while we're at it, let's see... What else can we ban? Max Mosley for one! I have to ask what decade Autosport are living in. The last time aerodynamics stalled because of hitting a kerb was when we had underbody ground effect. Hit the kerb, break the seal between the skirt and the track and stall the aero. At the same time we had porpoising because the body built up more and more downforce as it got lower to the track surface and then it got so low you couldn't get enough airflow and the car popped up to start the whole process again. Is Ferrari's front wing really running so close to the ground that it can be affected by a kerb? Can we expect to see the Ferrari nose porpoising down a long straight? One of McLaren's advantages over Ferrari in the past couple of seasons is its ability to ride kerbs. I would have thought with all the data and inspections the FIA collected and circulated last season Ferrari would be able to copy the McLaren suspension system. Massa's car broke away suddenly and while my initially thought was that it was a breakage the sound on the video Keith mentioned lets you hear the engine note rise before he spun. It was his heavy right foot that caused it. Massa was erratic before electronic toys (not just TC) and now they have gone he is back in trouble. i have seen people say that TC wouldn't have caught the car. I believe it would have but with all the other toys in place the car may have been more stable at the point he applied the throttle. I must disagree on the engine note thing, Steven - to me it looks and sounds as though the engine revs soared precisely because the rear tyres had let go. Before that, Massa was holding the revs constant. Over the years, the FIA have progressively raised the minimum height allowed for the front wing, in an effort to reduce downforce available. The lowest point is in the centre of the wing anyway, just below the nose, so it would not be affected much by the car cutting a curb. I'm afraid Autosport's explanation is a load of nonsense, which is a pity really - there was a time when they were pretty good on the technical side. Interstingly today, Massa has been quoted by a number of websites, as admitting that the lack of electronic aids has made the cars more difficult to drive on the limit. However, in the same interview, he also maintains that the spin in Malaysia was caused by a 'different problem' not related to traction control. Is this a diplomatic way of suggesting that it was a mechanical problem, but the team will not let him say as much? Or is this a driver trying to maintain his confidence by talking himself out of a pressure error? My feeling, having watched the video over and over, is that it is the latter. Whether or not that's an effective psychological strategy remains to be seen. I do agree with Keith though - Massa may lack finesse and consistency, but he is one tough little competitor, and I wouldn't be surprised to see him bounce back in Bahrain, just as he did last year. That's true, George - Massa is one little terrier of a competitor. I was thinking today that, even if the Malaysin spin was a case of Massa being the "different problem", Kimi made two mistakes in Melbourne, both undeniably his and not caused by a mechanical glitch. Yet it's Massa that everyone expects to be booted from the team now. I agree that it's likely at the end of the year that Massa will go but I'm not sure he entirely deserves it. If his performance improves over the rest of the year (and he could get a few wins, as he showed last year), he could hang on to his place. I agree Clive. I still think he deserves his place up at the sharp end of the grid - he is, after all, a proven, multiple grand prix winner, and there are not too many of those around. He also amassed an impressive 94 points over the course of last season. And you are right to point out that Kimi also made a number of unforced pressure errors in Melbourne - it's easy to forget that with the dominance of his performance at the weekend. However, if I was Massa I'd be watching my back - the Alonso rumours have started even earlier than I suspected they might. Fernando won't countenance another season away from the front-line - in this respect his situation is reminiscent of Senna in the early 90s desperately trying to bargain his way into the Williams seat - and I'd be amazed if his management haven't made some kind of preliminary contact with Ferrari. It's going to be interesting to see how this one develops. One of the things that does impress me about Massa is his ability to continually improve as a driver and learn from his mistakes. He's going to need to do that like never before in the coming few weeks. Refering to a discussion above about Massa's 'engine speed' ...... my opinion is that it changed AS he lost it, not prior to losing it. "puff of black smoke", "suspension failure" , I missed that part but the engine note and visual seems to support concurance. For ALL of us relying on the TV coverage we'll probably never know, it's all speculation and opinion. I'll put forward that lost of rear down force (for what ever reason) likely initiated the incident. Well hello guys :) Great job! Congrats :). I am from Darussalam and learning to read in English, tell me right I wrote the following sentence: "Book your cheap discount airline tickets to dubai with opodo."